My husband and I joke about the day ‘the love rock’ hit us. It was a moment before we were dating, when each of us realized that we were very intrigued by one another. It was high romance after that. This little pinch pot is my clay ‘love rock’, which hit me a couple of months into my first clay class. It showed me that clay is the right medium for me. I was very disappointed when it came out of the glaze kiln. It looked so different from the vision I had in my head. When I was finally able to see the piece objectively, I saw that it was much better than what I had imagined. 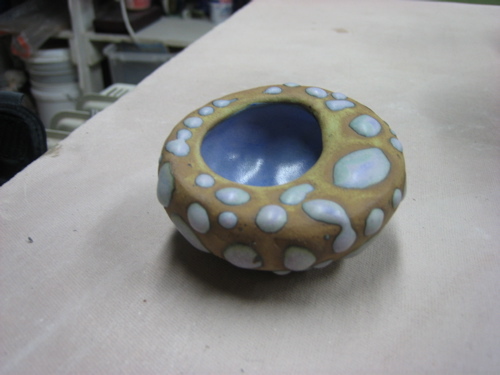 The interaction of heat, glaze, and clay had informed my vision. The collaboration between control and happenstance had produced a much more interesting piece. That is the power of this medium for me. This entry was posted on March 2, 2008 at 6:31 am and is filed under clay, inspiration, process, Uncategorized. You can follow any responses to this entry through the RSS 2.0 feed. You can leave a response, or trackback from your own site.